Two of my daughters and I enjoying the activities downtown Indianapolis. Have a “super” Friday! The weeks fly fast! They really do! We get so busy that one day slides into the next and suddenly a week, month and year are sliding by. There are days as a parent that feel endless, but if you stop for a moment and look at your child you soon realize how much he or she has changed and how quickly. 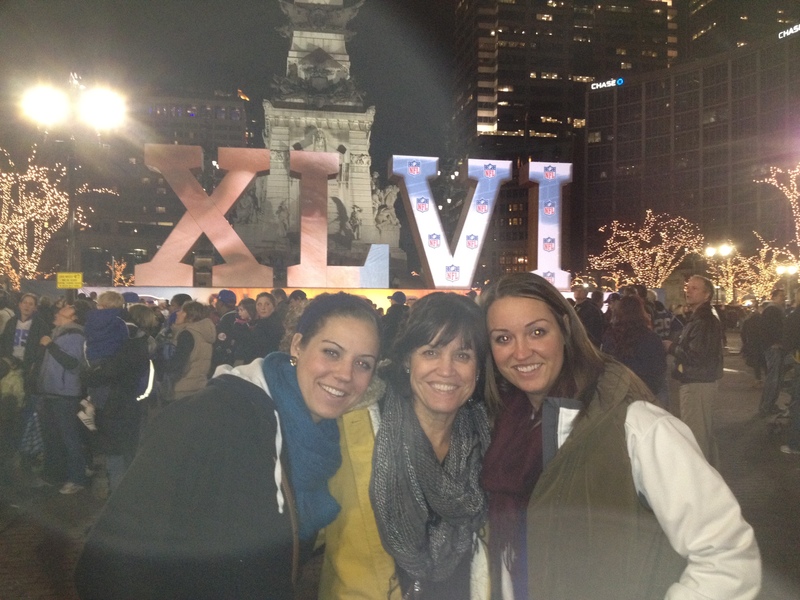 We went down to the Super Bowl Village in Indianapolis yesterday afternoon and evening. What a wonderful experience. Indianapolis is really shining this week. If you live in the area, take a trip down. There is so much to experience for little or no cost. I saw many young families in the afternoon enjoying the activities with their kids. One of the Moms who attended my groups a few years ago was volunteering! It was so nice to see her and see that she is continuing to do things that she enjoys while being a terrific mom. You can do both! Some of you that are living those first few months of a new baby may not believe me, but life becomes more predictable in a few months! Remember, time flies quickly so enjoy each stage, the wonderful with the challenging. So, it is Friday! Plan something fun for yourself and your family. Keep it simple, or be a little risky and pack the kids up and experience where you live. If that is Indy, take a trip downtown or to areas around the city with Super Bowl fun! If you do not live around Indy, take a look at local calendars. Parks departments, museums, libraries, all have family activities throughout the year that are free or affordable. Take advantage of where you live! Become active members of your community. It takes a little planning, but enjoying your community is fun and a great way for you to connect with other families. Even if you aren’t a football fan, plan a little family fun for Sunday. Remember celebrating the small moments makes life so much more fun. I’m rooting for the Giants and am looking forward to a few Super Bowl snacks. TGIF! Enjoy the celebration…Super Bowl and a Super Life! Websites to help enjoy Indy and the Super Bowl this weekend. ← Number 2 on the way….what were we thinking? ?